Whether it’s to get more active or to learn a new skill, the New Year is often filled with promises for self-improvement. But did you know that your dog could probably use some resolutions as well? 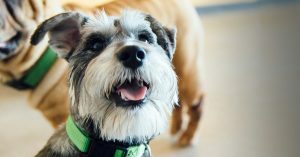 Here are six New Year’s resolutions for your dog that will benefit both you and your pup. Your dog, no matter their breed or age, is yearning to learn a new skill. It can be as simple as teaching them the basic commands like come, sit, shake or heel. These can be easily taught through repetition and reinforcement with tasty snacks. 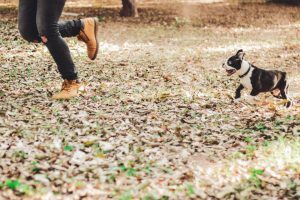 If they aren’t particularly motivated by treats, you can follow up your training sessions with a fun game of fetch, which most dogs love. For more advanced brain-teasing fun for your pup, look into purchasing interactive dog toys. Not only are these toys entertaining for your dog, but they also teach your dog that if they grab, pull or roll over the object, they will uncover the snacks you have hidden within them. They are the perfect toys to help your dog learn how to problem solve. We’re all guilty of occasionally giving our dogs more food than they need. Whether it is piling up their dog bowl with their normal food, giving them their unhealthy dog snacks because they look cute standing by the treat drawer or letting them have part of our burger by giving us the sad-eyed look, it’s easy to overfeed our pup. 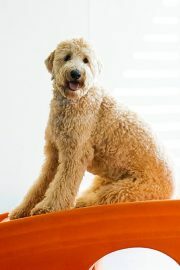 The quantity of food may need to be adjust slightly based on how active or inactive your dog is. Your veterinarian will advise you on the proper feeding amounts for your dog based on age, breed and overall health. 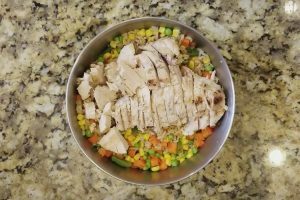 Following these instructions will help ensure your dog is getting the right amount of food each day. Depending on your dog’s age, you may want to look at switching them to an adult food if they are a puppy who has stopped growing. As well, if your dog is nearing old age, switching them to senior food might be a way to ensure they are eating better in the New Year. Going to the doctor is never a favorite activity for us as adults. For your dog, such a trip can be an even bigger stressor. However, the New Year is a great time to start taking your pup for regular check-ups with a vet. Such visits can ensure your dog is healthy and will help you avoid costly medical surprises down the road. 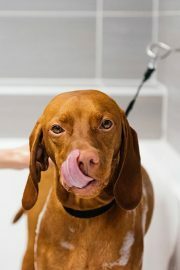 For dogs that are already healthy and in their prime, an annual visit to the vet should be enough. Once they are over 7 years old, you may want to look at getting them a check-up twice a year. These visits will give the vet a chance to listen to their heart, check their body temperature and make sure there are no physical signs of any internal issues that may affect them as they age. Is there a nagging problem with your dog that has been driving you crazy? Whether it’s barking at everyone who passes by your house or pulling on their leash whenever you go for a walk, take the New Year as a chance to start addressing those problems. All dogs love to learn new information and new behaviors. No matter what issue you are trying to fix with your pup, a combination of patience, consistency and reward will train them to stop doing that troublesome activity. This year, start taking your pup on longer, more interesting walks. If you walk them through the same parts of your neighborhood, try unfamiliar routes. If your average walk is 20 minutes, increase it to 30 minutes. Are there hills in your area? Try walking your pup up and down them. They will love investigating new areas along with getting extra exercise! Every dog needs a BFFF (Best Furry Friend Forever). 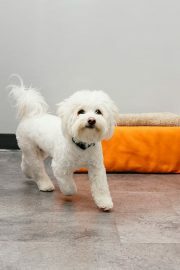 Dogs love hanging out with pals, running around, chasing toys and generally just being social with other pups. 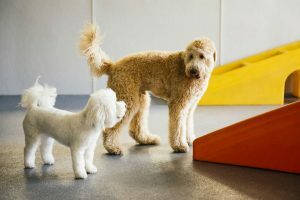 For the New Year, try taking your dog to the local dog park or a nearby dog daycare. Even if it is just once or twice a week, the socialization skills they pick up will teach them a new confidence that they can use in all situations. 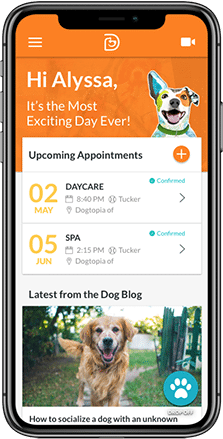 If you need help getting your dog more active or introducing them to some new friends, we here at Dogtopia can help. 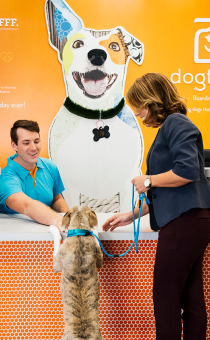 We offer a safe and fun-filled environment with an action-packed daily schedule to ensure your furry friend gets plenty of exercise and socialization while you are at work or running errands during the day. 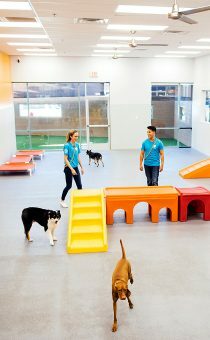 Learn more about our dog daycare services here or contact us for more information.